Fusarium patch, commonly called snow mould, is a common cause of brown patches on lawns, particularly in autumn or during mild spells in winter. This disease is caused by the fungus Monographella nivalis (formally Fusarium nivale). Unfortunately, it is one of the most damaging diseases of turf grasses and can be difficult to control. It is found most frequently during autumn, winter and early spring, but attacks can occur at any time of the year. Our Autumn/Winter feed and moss treatment will help. This compound toughens the grass and has an acidifying effect on the turf, which in turn discourages snow mould. This must be done at the right time of the year. We have a selection of fungicide treatments available that are effective against Snow Mould and Fusarium Patch. The fungus can survive temperatures as low at -20°C (-4°F), although the optimum temperature for growth is 12-19°C (54-66°F). 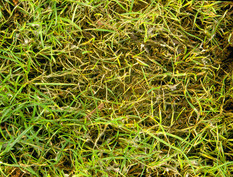 Infection can, therefore, occur in summer but is usually masked by rapid grass growth. The disease becomes more apparent as the weather cools and grass growth slows. The fungus requires surface moisture to infect leaves, and grass which is particularly lush due to high nitrogen levels is more prone to attack. Alkaline soil conditions also favour the disease. Snow mould develops under prolonged snow cover. The combination under snow of a fairly constant temperature of about 0°C (32°F) and increased levels of carbon dioxide are particularly favourable for Monographella nivalis. Another fungal disease called grey snow mould, caused by Typhula incarnata, can also develop under these conditions. The patch symptoms are similar but any fungal growth seen is greyish-white rather than pink. Typhula also produces tiny, brown, hard resting bodies, often looking like small seeds, scattered over the affected grass. Transforming Lawns across Surrey, Hampshire, Berkshire and West Sussex. If you are worried about Snow Mould or would like us to inspect your lawn please contact us.